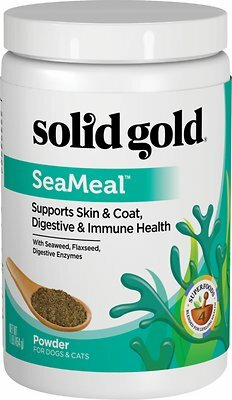 Keep your pal in tip top shape with the superfood power of the Solid Gold Supplements SeaMeal Skin & Coat, Digestive & Immune Health Powder Grain-Free Dog & Cat Supplement. It’s formulated with a blend of USA-sourced seaweed rich in vitamins, minerals, amino acids and antioxidants to support a healthy skin and coat and immune health. Then, because tummy and skin issues often go together, digestive enzymes and pineapple are added to maintain a healthy digestive system, plus flaxseeds and omegas for even more skin-nourishing action. Best of all, it’s easy to mix into your pal’s favorite wet food for a daily boost of superfood-powered nutrition. Supports skin and coat health in dogs and cats with USA-sourced seaweed that’s high in chlorophyll, iodine, and essential nutrients. Helps maintain digestive and immune health with natural digestive enzymes plus pineapple, B vitamins, zinc, selenium, iron and magnesium. Soothes and nourishes the skin and coat with omega-3 fatty acids and antioxidant-rich flaxseeds, and can be given to kittens and puppies too. Easy to mix into your pal’s wet food for daily feeding, and is made with no artificial colors, flavors or preservatives. Proudly made in the USA with absolutely no gluten or grains so it’s ideal for pets with sensitivities. Dried Seaweed Meal, Flaxseed, Dried Aspergillus Oryzae Fermentation Product,Dried Trichoderma Reesei Fermentation Solubles, Dried Rhizopus Oryzae Fermentation Product, Dried Pineapple, Dried Lemon Peel, Lactose. For best results, add to 2 meals daily for the life of your pet. Every jar includes a 1 tsp scoop. 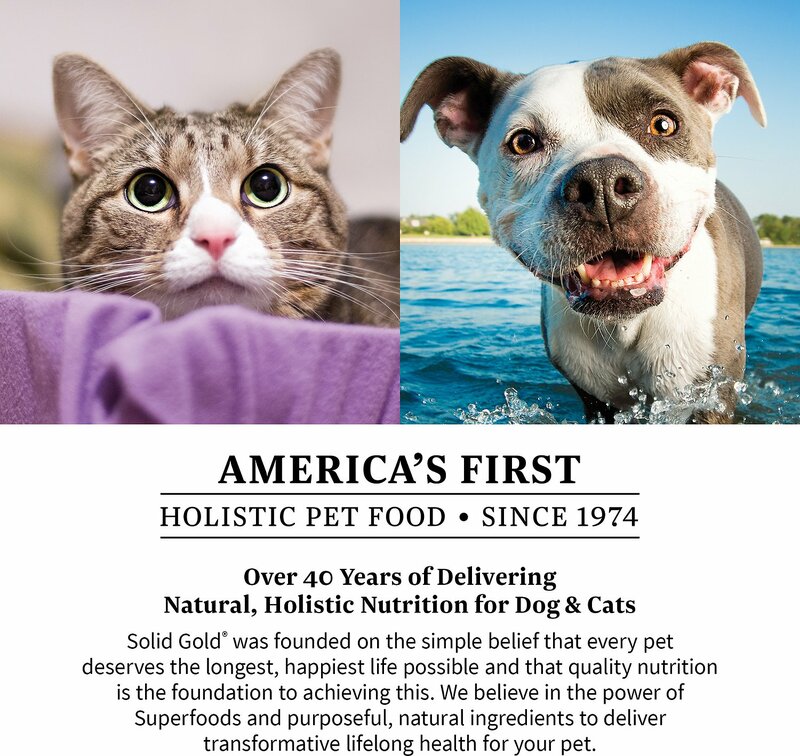 Crafted with your pet's well-being in mind, Solid Gold nutritional supplements provide a unique blend of all-natural and holistic ingredients that are safe for dogs and cats of all ages and sizes. You will never find meat by-product meals, chemical preservatives or artificial flavors in these incredible supplements. That's because Solid Gold uses only the highest quality ingredients, and they never source anything from China. I was looking for a supplement with digestive enzymes to help one of my cats who has IBD. I give the Seameal to both of my cats and they both love it. I mix it with a little hot water in the bottom of their dishes and then mix in their wet food and they gobble it up. I do feel like it's making their coats softer and my IBD guys has been having less tummy trouble. My dog was constantly itching herself due to dryness and seasonal allergies. After mixing this with her food for about a month or even less, I can definitely see a huge improvement in her skin, fur, and eyes. She’s not itching as much and is much more comfortable. This is so easy to mix with food. It either tastes good to my cat or he doesn’t mind the taste. His coat is so soft and silky now. After losing weight from throwing up all the time, he now has put weight back on and the only time he throws up is if he has a hairball. I highly highly recommend this! I’m always wary buying any kind of new food/supplement for my cats, as they’re super finicky (well they are cats). But they really like this! I mix it with their wet food & they gobble it up! Can’t say anything about results yet as it’s too soon, but I love solid gold, they make great quality products! I waited to write this review, I tried for a while to get my cats to eat this, considering it got such great reviews. However, I find I cannot get my cats to eat this, the smell seems to deter them from then eating the wet food that this is mixed into. Oh well, can't win them all. Tried to give this to both my dogs, and while it might be a decent product, neither of my dogs would eat their food if this was on it. I’ve used other brands of seaweed like this that they liked, so I’m disappointed that they refuse this. I even tried mixing it with canned food, which they don’t usually get and they usually love it, but they wouldn’t eat it if it had the SeaMeal in it. I have to admit my cats were a little put off the first time I added it to their food,but it may have been other reasons like not that hungry. The second meal and all others after, the kids just gobbled it down. We have a blind miniature Schnauzer whose eyes and skin are very dry. 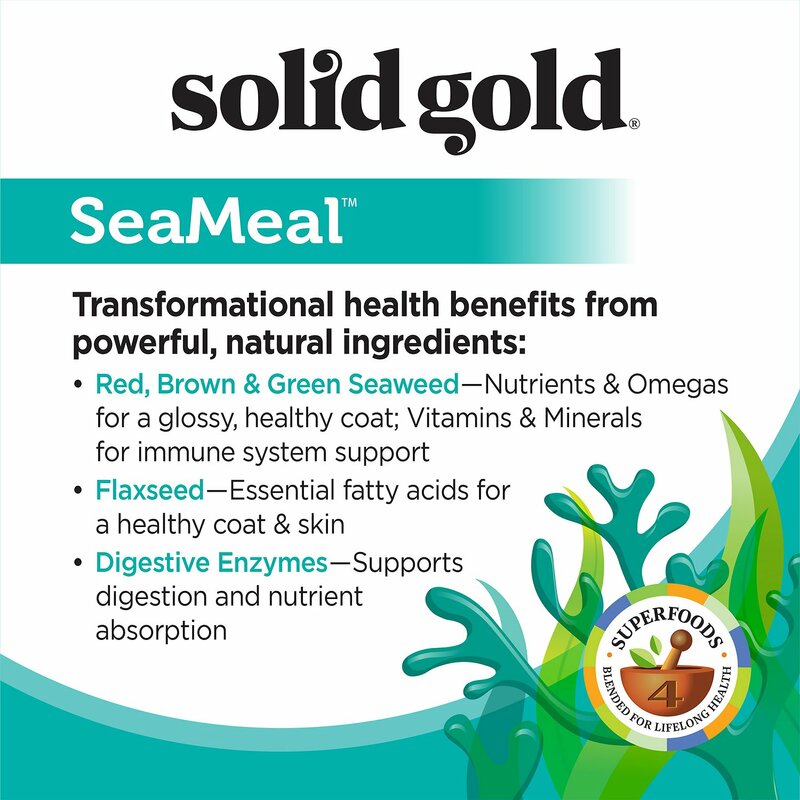 The omegas in the Solid Gold supplement help that condition and she loves the taste.